Dialogues are complementary windows which are useful in interaction with the user, to show some relevant information or demand input. The GtkDialog class provides subclasses for common dialogue use cases like the AboutDialog and MessageDialog used in the example file. (FileChooserDialog article). In the widget sidebar dialog widgets are integrated to the "Toplevel" section next to window widgets. Dialogs are complementary windows to grab the user's focus. They can fixed to a superordinated window but at least be configured transient to a parent window via General > Window Attributes Transient For:". The "About" dialog window in general gives information about the project, its version, license, participating programmers, translators etc. All this can be directly typed into Glade. 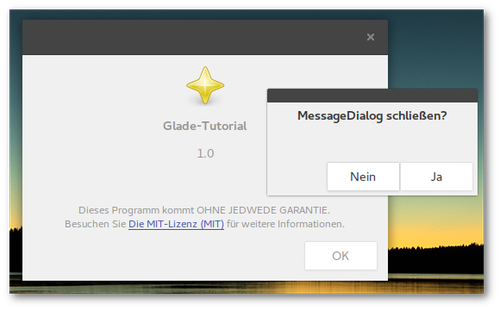 The MessageDialog is a standard dialog to show information or call for input. It is configurated to be drawn without window decoration or showing up seperately in the taskbar. Furthermore there is the possibility to add standard buttons. Dialogs already own an intern GtkButtonBox to place any buttons in. In constrast to regular windows the clicked signals of the buttons do not have to be assigned in these Buttonboxes (it's still possible to do so, of course). Instead in the "General" button properties you define a response answer (int) and assign the response signal of the GtkDialog. The huge advantage of that procedure is that the response refers to the dialog object so the responses can be processed by a single function. The problem of windows closed via destroy signal is that they cannot be reactivated therefore the delete-event signal is used here.